Sunburn – The morning read of what’s hot in Florida politics. By Peter Schorsch, Phil Ammann, Jenna Buzzacco-Foerster, Mitch Perry and Jim Rosica. THANK YOU for all of the kind and considerate well-wishes on my birthday. It was a great day, spent with Michelle and Ella Joyce. Our dinner at Cafe Ponte was pitch-perfect. And the Lego-themed cake Michelle had made was delicious. 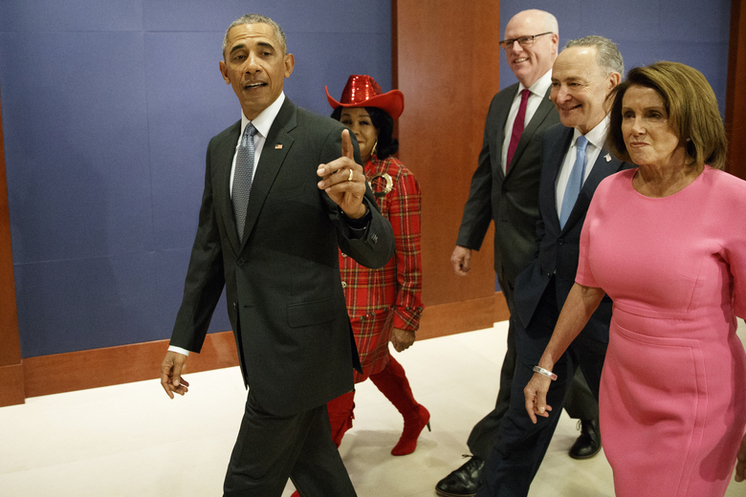 WE’RE ONLY HIGHLIGHTING THIS STORY BECAUSE WE WANT TO HIGHLIGHT FREDERICA WILSON’S HAT – Florida Rep. Frederica Wilson was at President Obama‘s side Wednesday morning as he arrived on Capitol Hill to strategize with Democrats how to protect the Affordable Care Act, reports Alex Leary of the Tampa Bay Times. More Floridians have enrolled in Obamacare than any other state and South Florida is a big driver of that. But that hasn’t stopped criticism of the cost and Donald Trump won the state in November, vowing to “repeal and replace” the law. Gov. Rick Scott has said he wants to play a role in the dismantling, serving as a bridge between Washington and the states. JEB BUSH WON’T ATTEND DONALD TRUMP INAUGURATION via Alex Leary of the Tampa Bay Times – George W. and Laura Bush will attend, as will Bill and Hillary Clinton. Jeb Bush has had positive things to say about Trump’s personnel moves and has taken some heat online. But there is some context. Some, including Scott Pruitt (EPA) and Rex Tillerson (Secretary of State) supported Bush during the presidential primary. Others, such as Betsy DeVos (Education) Andy Puzder (Labor) have personal ties to Bush. MARCO RUBIO LANDS APPROPRIATIONS COMMITTEE SPOT via Patricia Mazzei of the Miami Herald – Rubio, sworn in this afternoon to a second term, has taken on two new committees: Appropriations and the Special Committee on Aging. He retains his posts on the Committee on Foreign Relations, the Select Committee on Intelligence, and the Committee on Small Business and Entrepreneurship. He will no longer serve on the Committee on Commerce, Science and Transportation, which had oversight on space issues. CARLOS CUBELO GETS SEAT ON POWERFUL HOUSE TAX-WRITING COMMITTEE via Patricia Mazzei of the Miami Herald – Curbelo … was rewarded Wednesday with an appointment to the powerful House Ways and Means Committee, which writes tax law. “This new position will allow me to advocate for many issues of importance to my constituents and our South Florida community, such as strengthening Social Security and Medicare by reducing fraud and making these programs sustainable for all generations of Americans and also the promotion of free and fair trade — a major economic driver in our community,” Curbelo said in a statement. RICK SCOTT WANTS TO HIRE COUNTERTERRORISM AGENTS via The Associated Press – Scott wants to spend nearly $6 million to boost the number of state agents dedicated to counterterrorism efforts … Scott will ask legislators to include enough money in the annual budget to hire agents who will be stationed in seven regions across the state. Florida Department of Law Enforcement Commissioner Rick Swearingen last fall first recommended hiring 46 additional agents. ASSIGNMENT EDITORS: Scott will hold a press conference to highlight his proposal to add $5.8 million to the budget for 46 counterterrorism agents at 10 a.m. at the Florida Department of Law Enforcement, 4211 North Lois Avenue in Tampa. 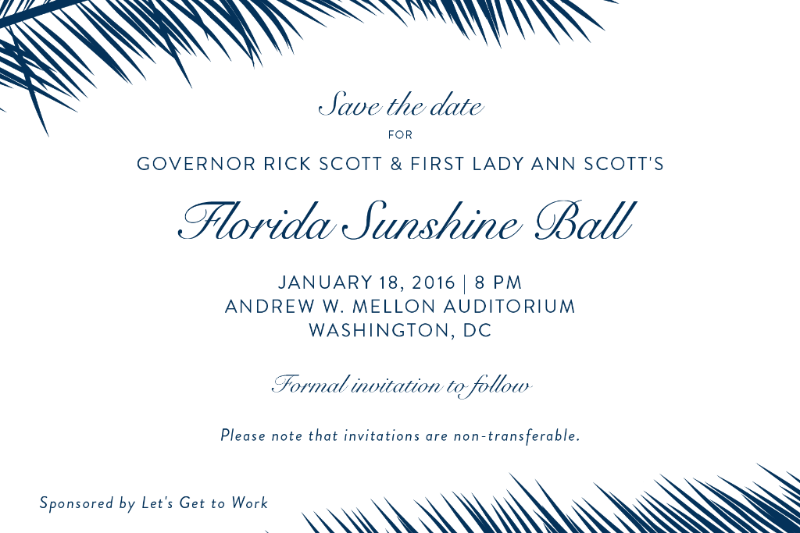 SCOTT TO HOST INAUGURAL BALL IN D.C. via Patricia Mazzei of the Miami Herald – Scott and his wife, Ann, will host an inaugural ball to be held in Washington D.C. two days before Trump is sworn in as president. … Though state political parties often organize inaugural balls, this one is being put together by Scott’s political committee, Let’s Get to Work. 2018 WATCH – ANDREW GILLUM, POSSIBLE 2018 GOVERNOR CANDIDATE, LAUNCHES ‘CAMPAIGN TO DEFEND LOCAL SOLUTIONS’ via Jenna Buzzacco-Foerster of Florida Politics — Tallahassee Mayor Andrew Gillum is fighting for local rights, announcing this week he’s launched a statewide campaign to “defend local solutions.” A rising star in the Democratic Party, Gillum has been mentioned as possible 2018 gubernatorial contender. He announced today he’s launched the Campaign to Defend Local Solutions, a nonpartisan, grassroots effort aimed at bringing together “individuals, organizations, and elected officials concerned about the erosion of local rights.” And this new organization could help boost his profile across the state, especially when it comes to red meat issues for Democrats. “This effort … will send a message to state lawmakers, and give citizens around the country the tools to push back against special interest groups and large corporations, and maintain their right to put forward local solutions to the issues facing their community,” said Gillum. Among other things, Gillum said the group will “hold events to rise against looming threats on issues like minimum wage and health benefits, the environment, local hiring practices, and water quality.” … The announcement comes just days before the 1st District Court of Appeals is set to hear oral arguments in a case involving Gillum and the city of Tallahassee after the City Commission decided not to repeal city codes regulating firearms. CENTRAL FLORIDA’S LEE CONSTANTINE COULD RUN FOR CFO via Jacob Engels of the Seminole County Post – As the sun sets on Jeff Atwater‘s reign as Florida’s most visible and successful Chief Financial Officer … Seminole County Commissioner Lee Constantine may be a leading contender to replace him. Constantine, who has held varying public offices during his 36-year career in public service, spent time as a State Representative and State Senator, representing locales in both Seminole and Orange County. During his time in the state legislator, Constantine was a fiscal hawk and crafted important legislation tackling high interest rates from predatory fly-by-night pay-day lenders … He also protected consumers with a piece of legislation that stopped gift card providers from charging monthly fees … Before that, he served as Mayor and Commissioner in the City of Altamonte Springs, also located in the all important I-4 corridor. ALAN CLENDENIN DISMISSES COMPLAINT FILED AGAINST HIM AS ‘BASELESS’ via Florida Politics – “Instead of making the case for why he’s the best person for the job, it appears as though this candidate is trying to win by clearing the field using baseless and unfounded complaints to disqualify his opponents,” Clendenin says about Bittel. “I want to be clear – the complaint filed today with Chair Tant is baseless,” Clendenin continued. STEVE SCHALE blog post on the Florida Democratic Party here. AMBASSADOR CARLOS TRUJILLO? TRUMP IS RECRUITING MIAMI STATE LEGISLATOR FOR FOREIGN POST via Mary Ellen Klas of the Miami Herald — Trujillo, 33, the son of Cuban immigrants, is … being recruited by the Trump administration to serve as ambassador to a Latin American country somewhere in the Southern Hemisphere, the details of which are still being negotiated. “It’s a great opportunity to serve your country,” Trujillo told the Herald/Times. “It’s humbling. But it has to be the right country and the right time.” Trujillo, who is a member of House Speaker Richard Corcoran’s inner circle, was recently named to the powerful post of House Appropriations Committee chairman. He expects an announcement from the Trump administration in early February and, if it happens. he will remain in office long enough to serve through this legislative session because of the lengthy vetting and Senate confirmation process. LAWMAKERS HEADING TO ARIZONA FOR GAMBLING CONFERENCE via Florida Politics –Eight Florida lawmakers have signed up to attend this weekend’s meeting of the National Council of Legislators from Gaming States in Scottsdale, Arizona. On the RSVP list: State Rep. Halsey Beshears … State Rep. Jose Felix Diaz … He chairs the House Commerce Committee, which oversees gambling policy. State Sen. Bill Galvano … Galvano has long been involved in gambling issues … State Rep. Joe Geller … the Democratic Ranking Member of the House Tourism & Gaming Control Subcommittee. State Sen. Audrey Gibson … a member of the Senate Regulated Industries Committee, which oversees gambling-related legislation. State Rep. Mike LaRosa … chairs the House Tourism & Gaming Control Subcommittee. State Rep. David Richardson … State Sen. Perry Thurston … also a member of the Senate Regulated Industries Committee, and is chair of the Council’s Committee on State-Federal Relations … the conference is “organized and produced” by New Jersey-based Spectrum Gaming Group. FANTASY SPORTS BILL FILED AGAIN IN LEGISLATURE via Florida Politics – A bill to exempt fantasy sports play from state gambling regulation has again been filed in the Florida Legislature. State Rep. Jason Brodeur, a Sanford Republican, filed the measure on Wednesday. The bill would clarify that fantasy contests “reflect the relative knowledge and skill of the participants” and are not games of chance – and thus potentially illegal gambling. (Similar bills didn’t move last year.) … “The millions of Floridians who play fantasy games deserve to know that what they’re doing is not a crime,” Brodeur said in a phone interview. JUDGE SAYS NO TO GRETNA TRACK IN GAMBLING DISPUTE via Florida Politics – A federal judge has turned down a request by a North Florida race track to alter his ruling allowing the Seminole Tribe of Florida to keep blackjack at its casinos. But the loss turned out to be a win for the track’s own card games. Senior U.S. District Judge Robert Hinkle said … “(t)he judgment in this case has no binding effect on Gretna.” His decision, then, in the Tribe’s case has no effect on Gretna’s or other tracks’ card game operations. “We are certainly appreciative of the judge’s consideration,” (attorney Marc) Dunbar said. PEDIATRIC CARDIAC CARE BILL COULD PUT FORMER AHCA SECRETARY-TURNED-LOBBYIST AT ODDS WITH GOVERNOR via Christine Sexton of POLITICO Florida — Former Agency for Health Care Administration Secretary Liz Dudek may find herself at odds with her former boss, Gov Rick Scott, this session and working alongside people in her past life she often opposed: pediatric cardiologists. Now a lobbyist with Greenberg Traurig, Dudek has been hired by the Nemours Foundation to help secure passage of SB 62, filed by Sen. Aaron Bean, a Fernandina Beach Republican. The bill would re-establish a pediatric cardiac advisory council within the state Department of Health and authorize the department, along with the agency that Dudek once headed, to coordinate and develop rules related to pediatric cardiac facilities participating in the Children’s Medical Services Network, a Medicaid program for children with complex health care needs. HAPPENING TODAY – LEGISLATIVE DELEGATIONS ACROSS THE STATE MEET — The Martin, Lafayette, Gilchrist, St. Lucie, Dixie, Nassau, Gulf and Franklin legislative delegations will meet ahead of the 2017 Legislative Session. The Martin County legislative delegation will meet at 9 a.m. at Stuart City Hall, 121 SW Flagler Ave. in Stuart. At 10 a.m., the Lafayette County legislative delegation will hold its meeting in the County Commission Chamber at the Lafayette County Courthouse, 120 W. Main Street in Mayor. The Gilchrist County legislative delegation will hold its meeting at the County Commission room at the County Commission Meeting Facility, 209 SE 1st Street in Trenton; while the St. Lucie County legislative delegation will hold its meeting at 2 p.m. at Indian River State College, 3209 Virginia Ave. in Fort Pierce. The Dixie County legislative delegation will hold its meeting in the county commission chamber at the courthouse, 214 Northeast Highway 351 in Cross City. The Nassau County delegation will also meet at 2 p.m. in Nassau County Commission chambers at the James S. Page Governmental Complex, 96135 Nassau Place in Yulee. The Gulf County legislative delegation is scheduled to meet at 5 p.m. at the Robert M. Moore Administrative Building, 1000 Cecil G. Costin Sr. Blvd. in Port St. Joe. At 7 p.m., the Franklin County legislative delegation will meet at the Franklin County Courthouse Annex, 37 Forbes Street in Apalachicola. ASSIGNMENT EDITORS: Rep. Carlos Guillermo Smith and Sen. Linda Stewart, both Orlando Democrats, will hold a press conference at 1 p.m. at the Orange County Courthouse, 425 N. Orange Ave. in Orlando to announce proposed gun safety legislation. The two lawmakers will be joined by members of the Florida Coalition to Prevent Gun Violence and survivors of the Pulse shooting. Members of the media should RSVP to ida.eskamani@myfloridahouse.gov. SUPREME COURT RESCINDS ORDER BLOCKING DEATH SENTENCES IN FLORIDA via Michael Auslen of the Tampa Bay Times – The court took an unusual step in rescinding an order that said Florida’s death sentencing laws, ruled unconstitutional in October because they did not require a unanimous jury vote for the death penalty, could not be used to prosecute cases. The court also deleted the earlier order from its website. The … ruling was vacated because of a “clerical error,” said Craig Waters, a spokesman for the court. It’s not clear what that error is. However, Public Defender Rex Dimmig, who serves Polk, Highlands and Hardee counties, said the court referenced the wrong statute in its earlier ruling. He does not know for certain why the court rescinded its order, but he says he has one idea: Instead of writing that death penalty laws in section 921.141 of Florida Statutes was unconstitutional, the court identified section 941.141 — a statute which does not exist. FLORIDA BOARD OF EDUCATION EXPECTED TO SET RULES ON NEW PRINCIPAL PROGRAM via Jeffrey Solochek of the Tampa Bay Times – A new school leadership program aimed at giving more flexibility to principals running some of Florida’s most struggling schools could soon have more defined guidelines for its operations. The State Board of Education is poised to consider a new rule for the “principal autonomy pilot” that Rep. Manny Diaz, incoming chairman of the House PreK-12 Appropriations committee, pushed through the Legislature in 2016. The Pinellas County school district is one of seven set forth in law as eligible to participate. FLORIDA-GEORGIA WATER CASE OFFICIAL ORDERS SETTLEMENT TALKS via Kathleen Foody of The Associated Press – Special Master Ralph Lancaster gave the states until Jan. 24 to meet and encouraged them to use a mediator. He also ordered the states to file a confidential report to him by Jan. 26 summarizing their efforts to reach a settlement. The dispute focuses on a watershed in western Georgia, eastern Alabama and the Florida Panhandle. The Chattahoochee and Flint rivers flow through Georgia and meet at the Florida border to form the Apalachicola River, which flows into the Apalachicola Bay. Alabama isn’t directly involved in this case but has sided with Florida, encouraging a cap on Georgia’s use. After Florida filed the suit against Georgia, Lancaster was appointed by the U.S. Supreme Court to make a recommendation. The Supreme Court has the final say. FLORIDA PANTHER DEATHS STILL AT RECORD HIGH via The Associated Press – A record number of endangered Florida panthers died again last year – 42 of the remaining big cats were killed, matching the 2015 record. Thirty-four were hit by vehicles in southwest Florida, where development is shrinking what’s left of their habitat. The tally kept by the Florida Fish and Wildlife Conservation Commission includes six new litters, with a total of 14 cubs born in 2016. But the state estimates that only 100 to 180 of the big cats remain in the wild. OP-ED: HOME SHARING HELPS BOLSTER OUR FAMILY FRIENDLY TOURIST BRAND via Tom Martinelli for the South Florida Sun Sentinel – Home sharing helps our community cast a wider net to prospective travelers whose budgets simply cannot accommodate higher hotel rates. It also allows visitors to authentically experience Broward as we locals do, while driving tourist dollars and activating economies in neighborhoods that lack hotels. Ultimately, the power of the Airbnb platform is that it motivates guests to blend into neighborhoods, belong anywhere and live like locals. Our mission is to welcome visitors while maintaining the fabric of what makes these communities so special. Our Airbnb hosts want to serve as steadfast partners to bolster Broward’s family friendly tourist brand. The home sharing movement has already instilled community economic development while offering visitors a genuine — if temporary — home away from home. A collaborative partnership between Airbnb, our hosts and policymakers will promote responsible tourism consistent with Broward’s brand and values. WHAT JACK LATVALA IS READING – PSTA, HART TAKE STEPS TO FORMAL WORKING PARTNERSHIP via Anne Lindberg of Florida Politics – The general goal is to streamline services to save money and provide better service for transit riders, PSTA CEO Brad Miller said. The agreement sets out areas in which the two agencies already collaborate, such as a regional fare collection that uses one informational app that applies whether the customer is in Pinellas or Hillsborough. The regional fare collection app includes not only PSTA and HART, the Hillsborough transit authority, but Sarasota, Pasco and Hernando counties as well. PSTA and HART are also partnering on such items as the purchase of some equipment and on goal-setting and legislative priorities. The two would continue collaborating on those items and would research areas that could benefit from joint ventures. That could eventually mean the merger of some departments, Miller said. BRIAN BURGESS: MY POLITICAL PREDICTIONS FOR 2017 via The Capitolist — If there’s one thing about Florida politics that is utterly predictable, it’s the utterly unpredictable nature of Florida politics. 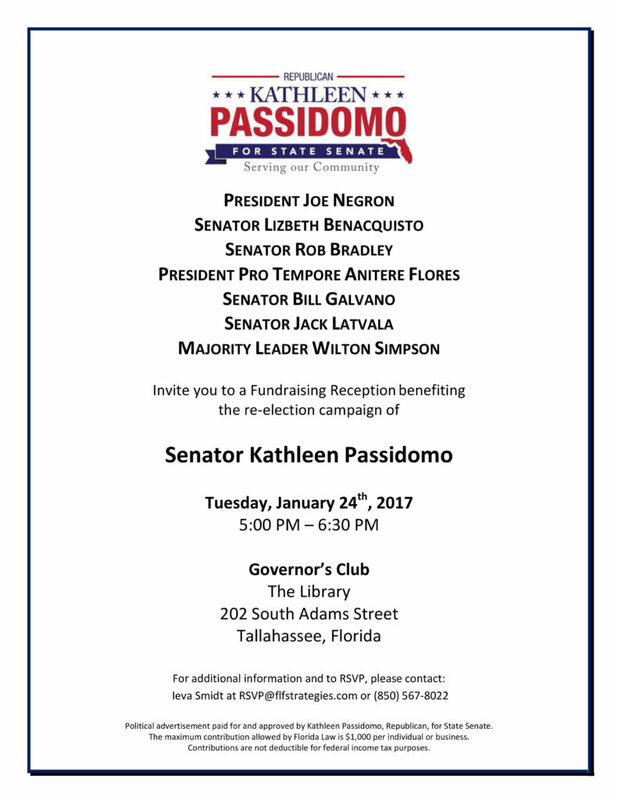 … What follows are predictions based on the best available information we have as of January 4th, 2017: Adam Putnam won’t be Bill McCollum … Putnam’s team is smart – if a bit overly cautious – and they are well aware of the whispering going on in Tallahassee comparing the 2010 cycle to how things are shaping up for 2018. They are aware of the similarities, they are aware of McCollum’s mistakes, and they are aware of just how radically different the 2017-2018 cycle will be compared with how things were in 2009-2010. … Putnam isn’t going to take anything for granted, nor should he. And he’s better funded, better informed, and better equipped as a candidate than McCollum ever was. Gwen Graham and John Morgan will negotiate a deal – both are media darlings, neither wants to engage in the sort of trench warfare necessary for one of them to emerge as the Democratic nominee for Florida governor in 2018. … Rick Scott won’t announce a run for Senate in 2017 – Scott has mastered the art of the talking point, and he can easily push off questions about his political future until the week before the filing deadline in the spring of 2018. …There’s nothing to be gained by making it widely known that he has ambitions beyond the governor’s office. One Burgess prediction we’re fond of: Strapped for funds, some Florida newspapers will strike a syndication deal with Peter Schorch’s FloridaPolitics.com … While some people in Tallahassee (the press corps included) can’t get past the fact that Schorsch’s operation started as a blog, it has long since evolved away from that. He employs a number of experienced political reporters and he gives them free reign over the beats they cover. He produces more free content than most of the rest of the capital press corps combined. And it’s effective, too. HELP WANTED: CONTRIBUTION LINK IS HIRING — Contribution Link is looking to immediately fill up to three part-time positions. The detail-oriented support positions are based in Tallahassee and assist account coordinators with client servicing, research, data base maintenance and graphic design. Compensation is based on individual skill; $10 an hour and up. Each position allows for 15-25 hours per week with the possibility of more and can reasonably accommodate school schedules. Requirements include working well with others, reliability and discretion with information. Ideally, applicants would have experience/ proficiency in one or more of the following areas: MS excel, statistics, social media or graphic design. Interested? Email Brittney Prahlow at Brittney@contributionlink.com. FACEBOOK AGAIN HIRES SEBASTIAN ALEKSANDER FOR 2017 SESSION via Florida Politics – This makes the third year in a row that Aleksander will have represented the social media behemoth, based in Menlo Park, California. Among other major websites, he also represents Yahoo! Inc., records show. Facebook’s last significant interest in Florida legislation was a “digital assets” bill backed by state Sen. Dorothy Hukill, a Port Orange Republican. Facebook at first was against the bill because, the company said, it conflicted with federal online privacy laws. Hukill later amended the measure so that someone has to give “explicit consent” to someone else to access and control a particular account. The digital assets legislation (SB 494) became law earlier this year. PERSONNEL NOTE: DEBRA HENLEY OUT AT FJA, PAUL JESS IN via Florida Politics – Henley left her job as executive director of the Florida Justice Association last month and is temporarily being replaced by her deputy, Jess … Jess, who was called a “veteran association executive and attorney,” is now interim executive director … Florida Justice Association President Jimmy Gustafson is calling Jess “an outstanding leader who has a deep understanding of the important issues facing civil justice in Florida.” Jess, a U.S. Navy veteran, has been with the association for 28 years, serving as deputy executive director and general counsel. RIDE UBER FREE DURING COLLEGE FOOTBALL CHAMPIONSHIP WEEKEND via WFLA – Here’s how it works: Riders can open the Uber app and request “FOOTBALL” from 11 a.m. to 7 p.m. Saturday, Sunday and Monday as Tampa celebrates the College Football Championship weekend … Select riders will be given the ability to watch live football action via onboard Samsung tablets powered by the AT&T network. Be patient. Demand is expected to be high and availability to be limited. The service is available to anyone, not just AT&T customers. HAPPY BIRTHDAY to former state Rep. Doc Renuart, Bruce Cotton, and Christie Pontis of Century Link.